Alias(s) & Nicknames (If any): Nick, Nicki, The Angel of Death. Born in 1759, the son of the draper, Nicolas is sent to Paris in 1778 to study law. There he falls in love with the violin. He later takes lessons from Mozart, returning home after failing his exams. This failure causes him to believe he has no talent in the violin. He eventually begins to regard his instrument with a mixture of love and hate. 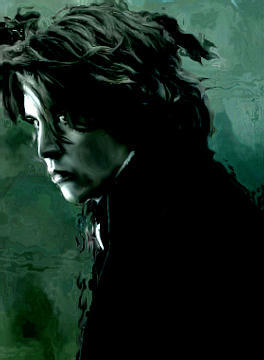 In 1779 he meets Lestat, who becomes his closest friend. They later run away to Paris, though Lestat regards this with optimism, Nicolas throughout the entire ordeal seems bent on the idea that they will fail. Quite the oppisite happens, they begin work at Renaud's House of Thespians, Nicolas as a solo musician. When Lestat disappears, he begins to drink heavily. Wounded at knowing Lestat is alive, and not with him, he grows to hate his best friend, believing Lestat is hiding some sort of great secret from him. Here he begins his actual plunge into madness. in 1780 he is abducted and tortured by the Paris Coven, until Lestat eventually comes to rescue him. He later fights with Lestat, demanding his friend share whatever secret he's found. Lestat makes him his second fledgeling hoping to bring Nicolas closer to him. The opposite happens. He becomes founder of the Theatre des Vampires, along with the few left from the Paris coven and Armand. In 1790 Armand punishes him for his excessively erratic behavior by cutting off his hands. After he is restored, he slips into silence, writes a new stack of plays, sends his violin to Lestat and goes into the fire. His attempts at suicide fail, leaving him badly burned, and for two hundred years he remains, hidden away from society, thriving off the blood and victims Armand brings. It becomes another case of Armand failing to tell Lestat about his surviving fledgling, as he had done with Louis. (Hope any eventual Armand's don't protest) He eventually emerges from his darkness, hunger, angry and mad, he is destroyed again. Returning as a dark angel, the same Nicolas, with black wings, minus the vampiric power, and plus sanity. He refuses now to touch his violin, to touch any instrument, preferring the simple job of a Bartender at the Dracula's Daughter Bar. Though he says little of anything about what he actually does outside work, and how he managed to return. There is something there, that never seems to fit with him. Something off, perhaps he really is mad, perhaps it's something of importance. He refuses to tell anyother what he does, killing the evildoer, not now for food, his reasons are unknown. His motives as well. To his friends he is a true guardian angel, to his enemies he is the incarnation of nightmares, the Angel of Death. His powers are still far beyond that of mortals. Though his weaknesses are the same, he can be killed as easily... that is, if you can see him coming.